The people you get to meet in this sport are just as amazing as the sport itself. People from all around the world come together with one common goal… To get in the air! Recently, an amazing young couple from New Jersey made their way out to California for training at the BlackHawk Paramotor Ranch. Thomas Santora and Darcy Maloney instantly fell in love with the amazing landscape and were very excited to explore it with a Powered Paraglider. “It’s really great to see couples getting involved in the sport together. 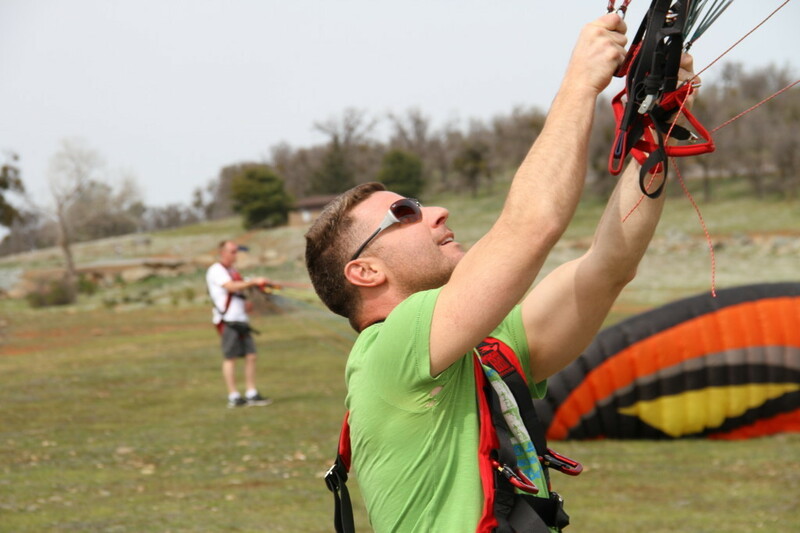 Tom and Darcy brought a great energy to the Ranch with them.” said Mike Robinson of BlackHawk Paramotors. Day 2 was just as productive as the first. The couple spent hours refining their newly acquired skills. They dug deep into the training syllabus, absorbing as much information as they could handle. The time was spent between mini-lectures and hands-on personal instruction. “If they got tired and needed a break from kiting, we would go right into a product-knowledge or instructional lecture. There wasn’t a minute wasted.” said Rick. Tom and Darcy finished another long and satisfying day, looking forward to some well-needed sleep. They were however, still able to muster up the energy to keep their non-stop smiles going. Day 3 was when things started to get exciting. Adrenaline was building up as the couple realized how close they were to leaving the ground. After some final adjustments to their form, the tow machine was brought out to the training field. The tow machine is a great tool for students to experience simulated flight, while at the same time having their speed and altitude controlled by an instructor. When Tom was asked about his first time off the ground, he exclaimed, “That’s the coolest thing ever!” Several flawless taxis later, flight was inevitable! Next BlackHawk Paramotors on Fox & CBS News Sacramento!